In House Guest, we invite Ecotone and Lookout authors and cover artists, as well as editors from peer presses and magazines, to tell us what they’re working on or thinking about or reading, to discuss themes in their writing or unique publishing challenges, to answer the burning questions they always hoped a reader would ask. The following essay is from Arna Bontemps Hemenway, on the immersive experience of reading Denis Johnson. 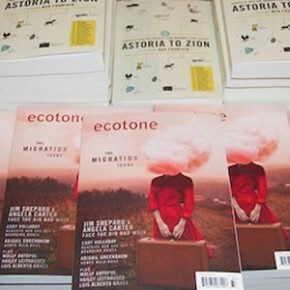 Arna’s short story, “A Self-Made Man,” appears in Ecotone 15. 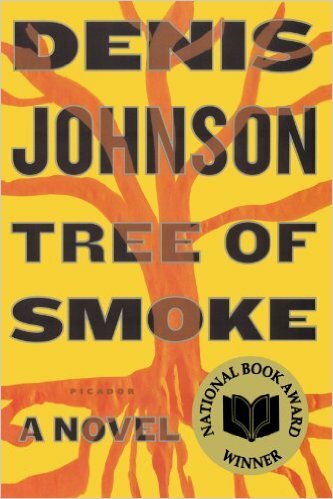 One of the realest places I’ve ever lived (or traveled, or remember) is actually the territory of a certain novel, Denis Johnson’s National Book Award winning Tree of Smoke. Tree of Smoke is a long book; at 720 pages, its length is possibly one of the reasons why it really feels as if you’re living in it as you read it. That’s also one of the things I like about it: it takes time. You have to live a not insignificant stretch of your life with it. You have to consider it when your thoughts drift throughout a month’s worth of showers, of doing the dishes, driving to work, walking to lunch. And this reading experience mirrors the lives inhabited in the book itself, in that they are inescapable. This is a book as much about the oppression of never being able to escape yourself and your own life as it is about Vietnam, or anything else. A “big, dirty, unmade bed of a book” is possibly one of the most accurate statements I’ve ever read in a review. It’s also true that if that sounds like something that you would find intolerable—that is to say, if you are more comfortable with a somewhat orderly or clean vision of life and love and suffering—you’re probably not going to enjoy this book. That’s okay, though. One of the things I admire most about the writing in Tree of Smoke is how little Johnson seems to be thinking about whether someone will enjoy it. As has been noted elsewhere, Johnson does seem to pick up and examine the different forms of Vietnam War narrative we have lived with in the four decades or so since it ended. But I think the truly remarkable thing is that he then sets them back down, finding them wanting. Then he strikes out into the jungle of his own vision.